SALT LAKE CITY, Utah – HARMAN’s DigiTech today announced its Vocalist Live FX vocal effect processor is now available. 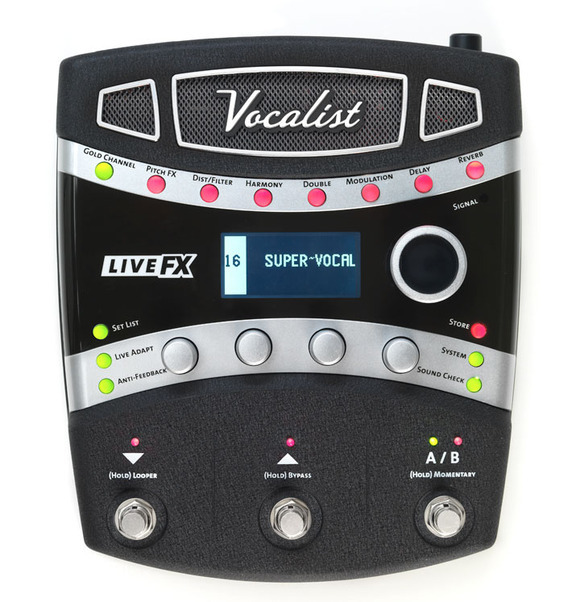 The Vocalist Live FX features over 65 studio quality effects designed to give performers the ability to immediately adapt to queues in the room, a band, and the singer. “We designed the Vocalist Live FX to help support singers by producing amazing studio quality vocal effects right out of the box that will empower their performances. Vocalists will immediately benefit from Lexicon® reverb, dbx® compression and Anti-Feedback Suppression that will enrich and ehance any live show,” stated Scott Klimt, marketing manager for DigiTech. The Vocalist Live FX also features a new Live Adapt technology which utilizes a built-in microphone and adapts the noise gate threshold, the pitch effect key, and the modulation and delay effect tempo settings with the music as it is being performed. The Vocalist Live FX is designed to enhance and improve virtually every element of a vocal performance. A sound check button automatically tests the presets for current room acoustics and the built-in Mic Pre+ allows the singer to engage their channel strip with the press of a button so they can sound great almost instantly. The unit also offers phantom power for the addition of condenser microphones. The Vocalist Live FX has an MSRP of $349.95.